Check your inboxes! Issue 11 of the Skills & Employability Review is out now. 2014's first set of labour market statistics by the Office for National Statistics (ONS) show UK employment figures increasing to 72.1%. The comparable rate of unemployment decreased to 7.1%. During June to August of 2013 there were 30.15 million people in employment in the UK, a growth of 450,000 from a year earlier. FELTAG & EDTech In The 1920s? Have you been following the FELTAG (Further Education Learning Action Group) conversation on Twitter? FELTAG was set up by the UK Government to find out how the further education (FE) and skills sector could embrace learning technologies and have been asking FE professionals for their opinions. There is no doubt that technology has the power to transform education from the way we teach, manage educational instructions, and design curriculum. Every generation has its own new technologies that are supposed to change education forever. Current trends in the FE sector include MOOCs, big data, and the flipped classroom, but what would we be talking about 100 years ago? In the 20's and 30's technologists predicted how the new inventions of radio and television would revolutionise the way we teach. Predications of Blackboards Delivered Through TV & Push Button Education seem to somewhat foresee current trends in online to learning and responsive curriculum design. 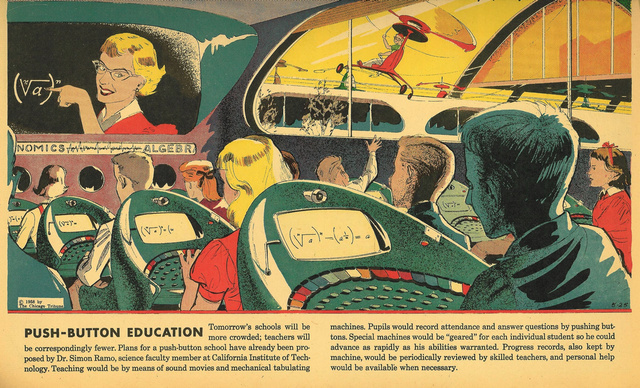 Some predictions from the 1960's go on to anticipate how computers would eventually make schools virtually obsolete. More fantastical and futuristic technology predictions envisioned a world where we would travel to our floating schools in pneumatic air pressure tubes and learn by plugging our brains directly into electronic books. I don't think that this is on the FELTAG discussion list just yet! Today I am attending a NIACE and UKCES seminar on Planning Locally Using Labour Market Intelligence To Meet Skills Needs. There is a clear consensus that skills are the key to economic growth, but how do we ensure that we are delivering the right skills? This seminar hopes to provide clarity on ways to accomplish this as well as providing an opportunity to share perspectives and challenges with others working in the sector. With presentations and panel discussions featuring Tom Stannard (Director of Communications and Public Affairs) and Simon Beer, (Programme Manger) from NIACE, and Carol Stanfield, (Assistant Director) and Marc Bayliss (Senior Research Manager) at UKCES, as well as NICK Porter of LGA this promises to be an insightful day. It has been a busy year blogging about further education, education funding and education technology. To kick off the New Year I have put together a list of the most popular posts from 2013. Figuring out who to follow on Twitter can take a bit of work, to make life a little bit easier we have compiled a list of the top people to follow in further education (with a few higher education pros thrown in too). As we prepare for the coming academic year the SFA and the Department for Business Innovation & Skills have commented on where the funding landscape is heading. A new best practice guide published by Ofsted examines how Halton Borough Council has developed outstanding employability provision. Examining the challenges colleges faced in aligning their curriculum to business objectives, wholesale curriculum redesign and responding to employer, learner and labour market demands. Take a closer look at education in the UK. Educations vs. unemployment, what does the public sector spend on education and how long do people stay in education and education? Professor John Perkins’ recent review of UK engineering skills examines the provision of engineers in the economy, offering recommendations to secure the talent pipeline. The latest workforce statistics from Office for National Statistics show UK employment figures have risen to 71.8%. Latest labour market statistics from the ons show UK employment at 29.71million, 336,000 more than this time last year with 72,000 fewer unemployed. Unemployment increases by 70,000. Statistics issue by the ONS estimate the UK workforce from December 2012 to February 2013.